For additional ideas on how to make your trip to Cancun more enjoyable drop by the FREQUENTLY ASKED QUESTIONS section of Cancun Expo. To travel into Mexico beyond the border areas (Cancun) Mexican law requires visitors to obtain a valid Tourist Card. This card must be validated at an Immigration office in Mexico and the $20 U.S. fee (approximately) must be paid at any Mexican bank. For travel by air or ship this fee is usually included in the cost of the ticket. For travel by road the fee must be paid by the individual traveler. Using pesos for purchasing goods and services in Cancun is not necessary as U.S. dollars are accepted almost everywhere throughout the Yucatan. However many of the shops and vendors are unable to handle large U.S. currencies such as $20's and $50's. Before departing on a trip to Cancun it is a good idea to obtain lots of small denomination bills. Having plenty of $1's, $5's and $10's is the perfect way to pay for goods and services in Cancun, and having these smaller bills allows you the added advantage to be more flexible when negotiating for gift items from vendors! It can also be fun to use Mexican pesos to purchase goods and services in Cancun. Mexican banks will usually give you the most favorable rate when exchanging U.S. dollars for Mexican pesos, while the Casas de Cambios (change houses) are a bit less competitive. For more information on currency issues in Mexico drop by the PAYING WITH PESOS section of Cancun Expo. This one issue can make or break your visit to Cancun. Most travelers to Mexico are coming from a country with a higher standard of living and a completely different culture. The more a visitor understands this the more enjoyable the visit to Mexico will be. Quite simply...you're not in Kansas anymore. There are several things that a visitor can try to anticipate that may be different than back at home. Although the pace of service has improved in many parts of Mexico and Cancun over the years, the manana attitude still prevails to some degree. Try to be patient if things don't happen as quickly as you would like. Expect slower service than at home and you won't be disappointed. 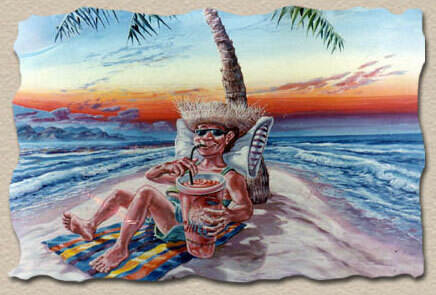 Relax...you are on vacation! Although most resort areas in Cancun are very clean and manicured, litter is common in many of the outlying areas. Simply put, many Mexicans have yet to catch on to the idea of not littering. And it may take a long time for that to change, if indeed it ever does. So look beyond the litter to the fantastic geography and the incredibly warm people. Chances are good that you will experience great weather while visiting Cancun. The Yucatan Peninsula is located in the tropics where the prevailing weather is warm and mild. However the tropics also feature the possibility of tropical storms and hurricanes from June through October. So taking a look at the latest satellite view before departing to Cancun is always a good idea for a "head's up" on what to expect. Most of these weather systems are brief with good weather soon to follow. For more information drop by the WEATHER section of Cancun Expo. Cancun is located in the tropics. This means the sun is more intense that at higher latitudes. Just a couple of hours in the sun can cause a serious sunburn for some people. A good idea is to put on sunscreen every morning as a part of your wake-up routine. Maybe sometime after brushing your teeth and before putting on your sandals. But certainly before you walk out the door for your day of fun in the Yucatan. Sometimes it takes a day or two to get into the vacation groove. Carlos Fiesta calls this the "decompression" stage of a vacation getaway. But once you get intothe 'zone' enjoy it each and every day from morning until night. Soon enough you will be back at home back to your primary reality wishing you had done more while you were away. Don't get depressed when your vacation is over and you are heading home. This is the perfect time to plan your next getaway. After all, planning vacations is almost as much fun as the actual trip! Almost. Just like the United States, Mexico has laws regarding the possession and use of drugs. The only difference is that the repercussions of getting caught with drugs in Cancun can be much more serious than in the U.S.
Getting caught with just one joint in your possession while traveling in Cancun might lead the officials to believe that you have additional involvement in illegal drugs. And while they sort out the details you are stuck in a Mexican jail, which is very different from a U.S. jail. You're not watching Sienfeld re-runs in a Mexican jail. Remember, under Mexican laws you are considered guilty until proven innocent. Yikes! If you really have to get high while in Cancun your best bet is to sample the local cervesa or tequila. They are some of the best in the world! If you bring a gun to Cancun and try to use the excuse that it was for your personal protection or for hunting it won't matter, you will not get a sympathetic ear. But it might buy you some time in a Mexican slammer. They've heard all of the excuses... well before you crossed the border. Carlos Fiesta has nothing against timeshares. They are a good concept that works well for a percentage of the population. But while traveling in Cancun your vacation time is very valuable, and the last thing you want to do is spend time in a stuffy conference room listening to a salesman sell you on the benefits of his resort while looking at a slide show of people laying around a beautiful pool. That should be you laying by the pool at the hotel you just paid for. H-e-l-l-o! 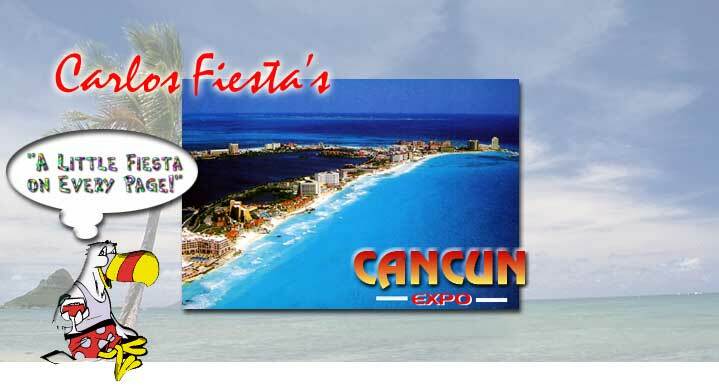 For more information drop by the TIMESHARES section of Cancun Expo. Driving in Mexico, whether it is your own car or a rental car, can add miles of depth to your visit to Cancun. And being properly insured can add miles of peace of mind for a relatively small cost. There are many companies that offer the required minimum liability insurance for driving in Cancun. They can be found at border crossing areas, on the Internet, and even here in Mexico Expo. When renting a car in Cancun you will have the option of purchasing just liability insurance, or also damage insurance for the vehicle. Some U.S. Insurance carriers will cover damage insurance to the vehicle if an accident takes place, many will not. It's a good idea to check with your U.S. insurance carrier to be sure. For more information on insurance in Mexico drop by the MEXICO INSURANCE section of Cancun Expo. Each year more visitors to Cancun choose to drive south of Cancun along the Mayan Coast. Driving is a great way to experience the true flavor of Cancun and the Yucatan. Look at the ground you cover by driving at night as bonus time. Take it slow and watch the road. Remember...a safe vacation is no accident (pun intended). For more information on driving in Mexico drop by the DRIVING IN CANCUN section of Cancun Expo. We'll keep it short here. Mexico can be very romantic. If you meet someone while vacationing in Cancun, either a local Mexican or a person from another part of the US or Canada, take it for what it is...Vacation Lust (VL). Not that there is anything wrong with VL, just adjust your expectations accordingly. And contrary to the popular wise crack, not everything that 'Happens in Mexico Stays in Mexico'. STD's don't get stopped at the border when you go home.